Staff selection commission (SSC) has invited application for CHSL’s various posts in 2016. The Online form is available from 8th October, 2016 and will close on 7th November, 2016. In order to simplify the process of filling of application for various examinations in SSC, and to make it more convenient for candidates, Jagranjosh.com has come up with some important instructions, while candidate used to fill the Application form. 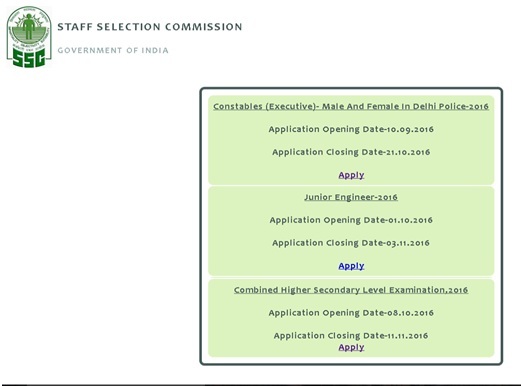 Staff selection commission (SSC) has invited application for various posts in 2016 for recruiting Postal/Sorting Assistants, Court Clerks and LDC/DEO on 5134 posts. The Online form is available from 8th October, 2016 and will close on 7th November, 2016. www.Jagranjosh.com has come up with some important Guidelines that must be adhered, when candidate used to fill the Application form. Step 1: - Navigate to http://ssconline.nic.in. 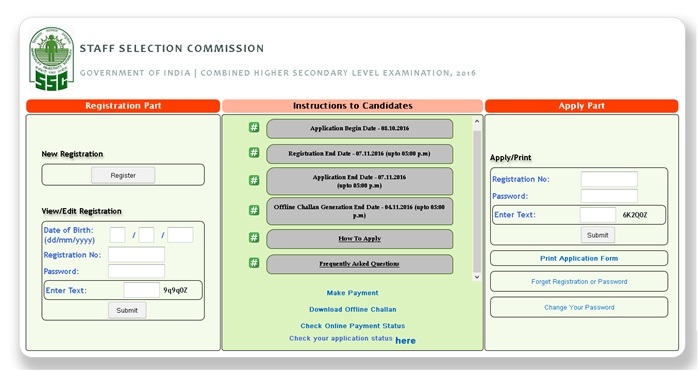 In this window, you have to click on Apply Button to proceed for the further steps in the CHSL Examination, 2016 section. After clicking on this button, following window will be redirected. Step 2: -This website contains this part, namely, Registration Part, Instructions to candidates and Apply Part. I. For New Candidate who has not registered before, can go through the first part under New Registration label, Click on the Register button. Following window will pop-up. a. Name: - In this Textbox, The Candidate is asked to enter his Full name as per his High School Mark sheet. 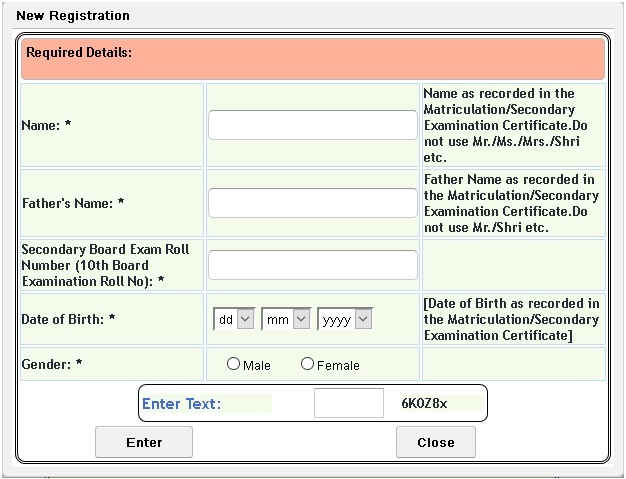 b. Father’s Name: - Under this Textbox, Name of father as per the high school Mark sheet is filled. c. Secondary Board Exam Roll Number (10th Board Examination Roll No. 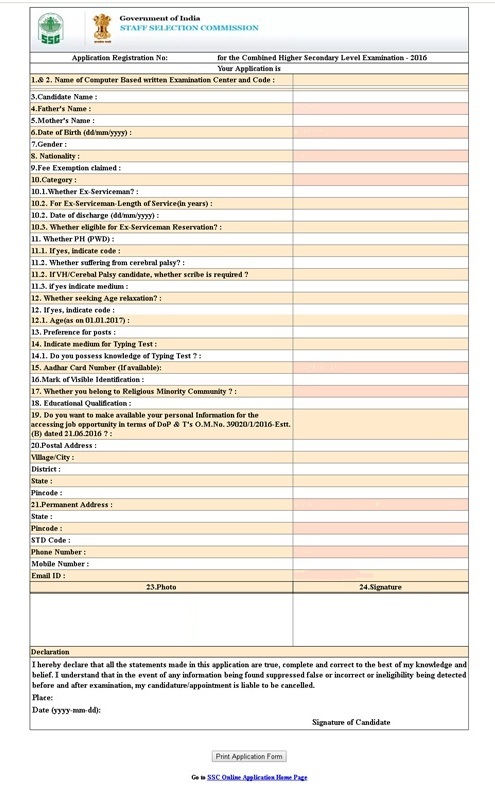 ):*- Fill it keeping your High School Mark Sheets before you as it is an unique entry and needed for further verification. d. Date of Birth: - Date of Birth is filled as per the DD/MM/YYYY format, and it should match with the high school Mark sheet. e. Gender: - There are two radio buttons for both sexes. f. Enter Text: - In this Textbox, A candidate is required to fill the code appended in the right corner of this block. It is only for testing that form is handled by a human being, not by robot/ web browser’s preset data. asking for the final confirmation. If you found all entries as per your consent then you can click on OK Button. Following Window will pop- up. 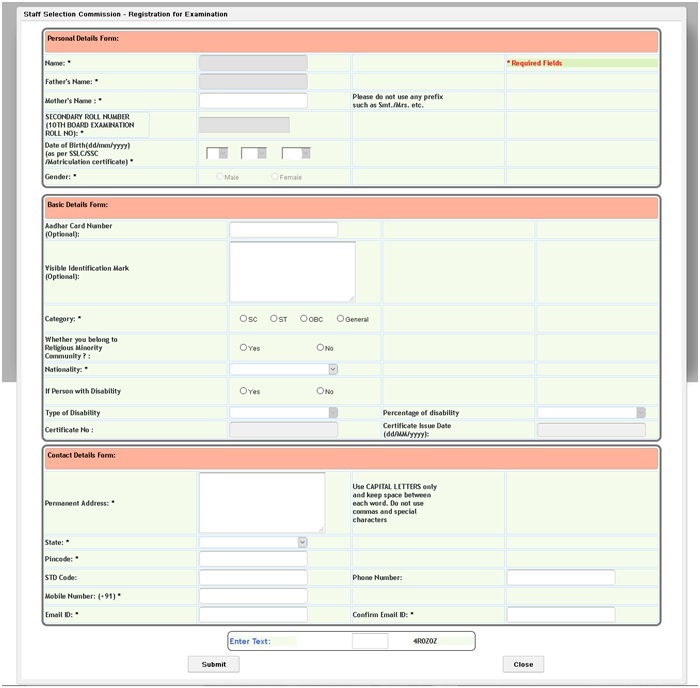 Step 3: - Above form is comprised of three sections, namely, Personal Details Form, Basic Details Form, Contact Details Form. In the first section, You are required to fill your Mother’s Name Only and In the second part, Following entries will be there. a. Aadhar Card Number (Optional): - It is a 12 digit unique number which is treated as identity proof and address proof. It is not mandatory to fill. b. Visible Identification Mark (Optional): - fill the visible and identifiable mark on your body. So, that examiner or Interviewer can easily spot it. This is an optional field. c. Category: - There are four categories, namely, SC, ST, OBC and General. Be careful while selecting the radio buttons. Because you have to present the certificate before the SSC panel issued by the respective State Government. It is mandatory to fill. d. Whether you belong to religious minority community? :- If you belong to other, then Hindu religion, then you are supposed to check on No Button otherwise check on yes Button. e. Nationality: - It indicates to the nation in which you are born and hold the citizenship. It is Indian by default. If you belong to any other country, then select others. It is compulsory to fill. i. Type of Disability: - If you are Visually handicapped (VH), Hearing handicapped (HH), Orthopaedically handicapped (OH), then choose the corresponding entries. ii. Percentage Disability: - there are two options, Choose as per the Physical conditions stated by a Physician. iii. Certificate Number: - Enter the certificate number issued by the concerning authority. iv. Certificate issue Date: - Enter the date mentioned in the certificate. Besides this in the third section, there are following entries. a. Permanent address: - Under this text box, Full mailing address is to be filled. Commas and spaces are not allowed to type here. b. State: - Select your existed residing state out of the mentioned list. c. Pin code: - It is 6 digit postal numbers. d. STD: - it is a unique number given by the telephone exchange. e. Phone Number: - In this text box, Landline number is entered. f. Mobile Number: - It may contain any personal cell phone number. g. Email-ID: - It contains a valid email-id. h. Confirm Email-id: - Before proceeding to the next step, Fill the same Email-id as it is present in previous text box. Enter Text: - In this Textbox, A candidate is required to fill the code appended in the right corner of this block. It is only for testing that form is handled by a human being, not by robot/ web browser’s preset data. After filling all entries correctly, You can press on Enter Button, then again a pop-up on the top of Web Browser will show asking for the final confirmation. If you found all entries as per your consent then you can click on the OK Button. Following Window will pop-up. Note: - Don’t Forget to mention your mother’s name in the first section Personal Details Form. Step 4: - As you proceed to this step, your Provisional Registration number and password are provided to you. Image Format must be .jpeg. Scanned Images can be formatted by MS-paint Software. After resizing it, you can save it as .jpeg/.jpg file format under the Save as Dialog Box. When upload photo and submit it, then following pop-up will appear. When upload signature and submit it, then following pop-up will appear. After Uploading the Photo and Signature, Click on Next Button. A pop-up will appear on the top of your web browser showing the phrase “Registration Completed”. Hence, an online form filling process will be terminated and you are redirected to the Main Page (http://164.100.129.99/chsl/). 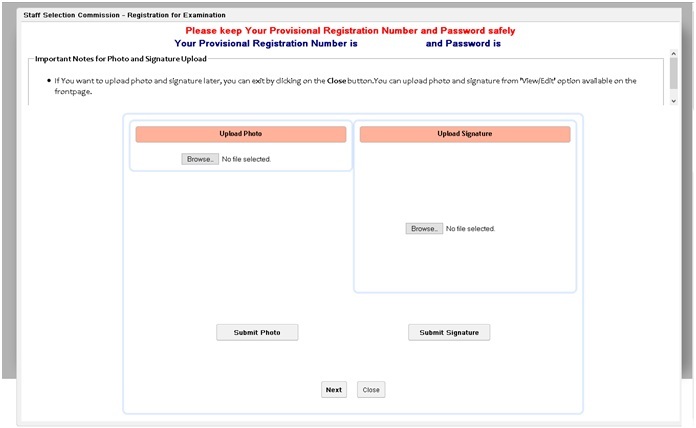 Step 5: - After registration, with Provisional Registration number and password, you can login into the main profile to complete the Part-II. Login can be done, under the Apply Part of the Main Page. Under this Section you have to enter your provisional registration number and password obtained in Step 5. After submitting the form, you will get the following form. Step 6: - In this form, You have to fill the information that is essential for future verification at the time of Interview. Therefore, be attentive at the time of filling these text boxes and few of them are already filled/ system generated. a. Name of Examination center and Code: - When you click on this dropdown text box, there are several Cities in these three boxes. Choose the examination center as per your convenience for Online test which is very necessary from the SSC’s point of view in center allocation. b. Whether Ex-Serviceman? : - If you had worked in any Government Department then You can check on Yes button. Otherwise, you can go with No radio button. a. For Ex-serviceman – Length of Service (in Years): - In this text box, you have to fill the served period in the particular organization. b. Date of Discharge: - You are asked to fill the date at which you have left your previous organization in the format of DD/MM/YYYY. c. Whether Eligible for Ex-Serviceman Reservation? : - There is an Affirmative Yes and Negative No. Choose appropriately to the best of your consent. c. Whether seeking age relaxation: - It is a mandatory field. If you are eligible for age relaxation check on Yes button. Otherwise, go with No button. a. if yes, indicate code: - If you chose to select Yes, then select the particular out of the drop down list to which you want to claim age relaxation. b. Age (as on 01.01.2017): - you’re not asked to fill this box. It is system generated age, which is calculated on the basis of date of birth filled by you. d. Preference of Posts: - There are five small text boxes in which you have to fill the character as per your choice out of the given pop-up window. e. Indicate Medium for Typing Test: - There are two options namely, English & Hindi in the corresponding Drop down menu. f. Aadhar Card Number (if available): - It is also system generated text area which is completed in Part-I registration. g. Visible identification mark: - In this text box, fill the easily visible identification mark on your body. h. Educational Qualification: - Under this text box, you are required to choose the name of degree earned by you. In case, if there is no degree listed on that. You can go with ‘others’ option. If So, then enter the proper educational qualification in the next text box. i. Do you want to make available your personal information for the accessing job opportunity in terms of DoP & T’s O.M. No. 39020/1/2016-Estt. (B) Dates 21.06.2016? * : - if you agree with this clause; Choose Yes otherwise Choose No. Contact Details Form: - Under this section, Contact details are retrieved with the following information. j. Postal Address: - write the mailing address in the capital letters at which official communication can be performed time to time. i. Village/City: - Fill the city in which the postal address actually exists. ii. District: - Fill the name of district under which above village/City resides. iii. State: - Fill it with the state in which mailing address is located. iv. Pin code: - It is a 6 digit unique number allotted to the cities by the Indian post office. k. Permanent Address: - All entries under this segment, is auto filled by system as you entered it previously. l. Declaration: - it is comprised of the confirmatory sentences and responsibility of the information given by you. Check on the I Agree button. m. Enter text: - Enter the system generated text in the text box for confirming that all details are filled by a human. After filling up all the above said entries, there are three buttons namely, Partial Save, Final Submit & Close. You can choose any of them as per your choice and convenience. When you click on Final Submit Button, then following Dialog Box will popped up at the middle of the webpage. After clicking on OK button, You will find the following screen on your system. Step 7: - In this step, You have to choose the following options. - Fee payment mode: - If you want to submit fee online through Credit/Debit card, then you can go with Online Option and for Offline submission, check on Offline button. After above stated entries, click on Submit button. Then you are directed to the following Challan page for offline payment mode. This is a downloadable Challan which can be submitted at any SBI branch on any working day. Hence, your registration process is finally completed. In case of online payment candidate will be redirected to Bank site with various payment option as follows. During payment, due to network problem if candidate face any problem he/she has to wait for 48 working hours for the settlement of payment. 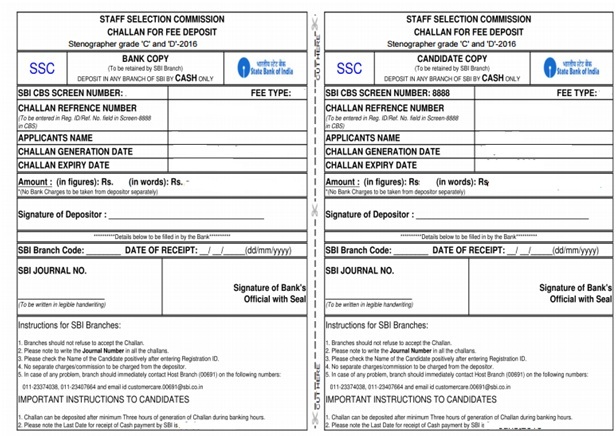 After completion of payment procedure, candidate may take a print out of their filled application form by logging in Apply/ Print option on the default page. a. Go and visit http://164.100.129.99/chsl/pdfprint/printstatus.jsp webpage. b. In this webpage, search for Print Application Form which can be found in Apply Part. When you click on this link following window will appear. c. Fill your Registration No. and password provided at the time of photo & signature uploading. After doing so, following webpage will appear which can not be altered. 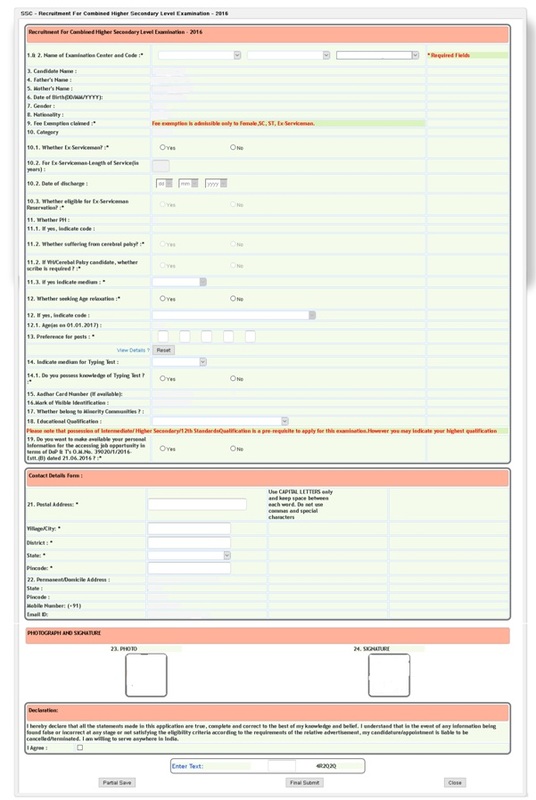 Step 9: - Click on Print Application form, you can print this entry filled file on A4 size paper for further record.